As business and technology continues to innovate, scale manufacturing is becoming tightly integrated into precision-based companies. While in the past, scales were primarily used in heavy-duty industries like livestock weighing or waste management, this stigma is changing. Today, scales help improve efficiencies in the semiconductor industry by counting small parts and are also used in various scientific applications to assist with chemical formulation. Arlyn Scales has been in the scale manufacturing and design business for well over three decades. Over the years, we’ve worked hard to not only listen to, but also respond to our clients’ needs. We offer a host of precision solutions providing durability unheard of in the scale industry. In addition, because our factory and headquarters are located side by side in Long Island, we’re able to ship factory direct. This factory-direct business model allows us to save our clients money, while offering features our competitors can’t provide even at much higher prices. When most businesses are deciding on a scale, they can either choose a scale that is extremely accurate with a low capacity or a scale that has a high capacity, but is not very accurate. This is a tough choice to make and one that the engineers at Arlyn Scales chose not to accept. To combat this common problem in the weighing industry, Arlyn Scales released Ultra Precision Scales that offer no compromise when it comes to weight or accuracy. Strain gage load cells were originally the only affordable load cell on the market. These load cells were made out of aluminum or another type of thin metal to ensure an accurate weight reading. To measure weight, those scales would typically measure the stress placed on the load cells to create a weight reading. Due to the inferior construction of strain gage load cells, these scales often experienced shock loading (where a load is dropped onto a scale from a height) or overloading, which would damage load cells—resulting in inaccurate readings. Once a scale is damaged, it has to be removed from service and either repaired or replaced. In addition, because a load cell is so thin, it is not able to give some businesses the resolution they need without being damaged. 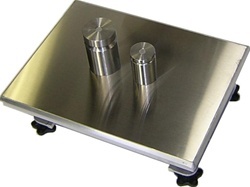 Until Arlyn released their Ultra Precision Scales, the only option consumers had to solve the common strain gage load cell issue was to use a Magnetic Force Restoration scale. While these scales are extremely accurate, they are subject to some of the same issues of strain gauge scales. They’re also vulnerable to changes in temperature, and typically only have a maximum capacity of fifty pounds. Finally they can cost as much as 10 times the price of strain gage scales. Arlyn Scales developed Surface Acoustic Wave (SAW) technology to help solve these common issues. Unlike a strain gauge scale that measures stress and strain, a SAW scale measures displacement. You only need an incredibly small amount of displacement for SAW load cells to provide an accurate weight reading. We design and build our SAW load cells in-house and secure them in pockets within the scale. We are also able to our load cells from more rugged metals, including stainless steel, to ensure they’re not subject to some of the same problems caused by strain gage and MFR scales. Such problems include temperature volatility, overloading and shock loading. Furthermore, we’ve been able to keep the cost down to roughly the cost of a strain gage scale while still offering models that are highly accurate even at large capacities. Before we introduced our Ultra Precision Scales for businesses, the accuracy of most scales was compromised as capacity increased. Using the SAW load cell, our Ultra Precision Scales are able to maintain accuracy and resolution in the 1:100,000-1:200,000 ranges. Our precision scales also offer an optional set point controller to assist with filling operations. The controller allows the scale user to enter up to eight weight values that can be stored. Once a weight has been reached, the controller can send a signal to turn a piece of equipment such as a pump on or off. This setup allows for automation in a variety of formula based industries. • USB – Connecting your scale directly to a PC via a USB cable can allow you to control your scale from your computer. You can also export weight data from your scale to your computer to be analyzed in a variety of different ways. Our Windows Interface Software allows you to view weight data on applications like MS Access or MS Excel. • Ethernet / Wi-Fi – If you’re looking to control your scale remotely, we also offer support for Ethernet and Wi-Fi connections. If you’d like to control your scale from within your company’s network, simply connect it to your local area network. If you’d like to control your scale from afar, you can use our Wi-Fi option to control and analyze data from your scale using our Remote Indicator Software. • Datalogging – Some of our clients are not able to connect a PC to their scale due to a variety of concerns. For such situations, you can simply connect a USB drive directly to your scale to download weight data to be used when you get back to your computer. If you’re looking for more information about how our Ultra Precision Scales can impact your business, don’t hesitate to contact our customer support staff today at 800-645-4301. We’ll be happy to go over the benefits of our Ultra Precision Scales and come up with a solution that meets your needs.